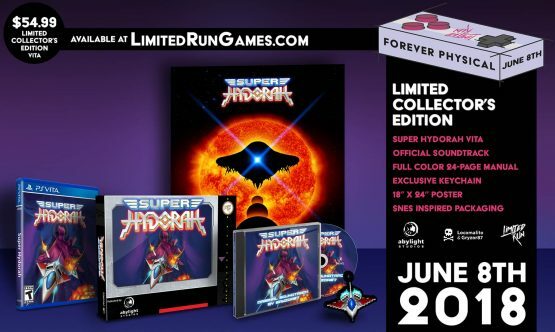 Abylight Studios and Limited Run announced today that they will be teaming up once again to offer fans the chance to grab a physical edition of Super Hydorah, the nonlinear shoot ‘em up inspired by the games of the past. The physical edition of the game designed by Locamalito & and Gryzor87 will launch on PlayStation Vita with two retail editions on June 8. Much like the previous PlayStation 4 release they did, Limited Run has said they will prepare two batches for the release, with 70% of their inventory being sold at 10 am EST with the rest being sold at 6 pm EST. Alongside the Standard Edition of the game, there will be 2,000 Collector’s Edition packages (which will cost $54.99) that include a region-free physical copy of the game for PS Vita, a full-color instruction booklet, the soundtrack for the game, a new edition poster, and a keychain, all of which is housed in a SNES inspired collector’s box. In Super Hydorah, an evil force has launched an invasion over the Omios star. Only you, the most skilled and deadly pilot in the galaxy, can face the dreadful menace of the Meroptians, bio-mechanical creatures set in a ruthless war of conquest. Equip your ship, select a route and fight planet by planet against the hordes of Meroptians! Will you be purchasing the physical edition of Super Hydorah?